Interviews with FF chair Jude Savage, FF founder Bob Hewitt and professional photographers Bo Wong and Roel Loopers. WHAT IS THE FOTOFREO TRUTH? The Fremantle Herald and West Australian newspaper today also report on the demise of FotoFreo, after I exclusively published on Freo’s View on Sunday that it would not continue because of funding problems. Fairness and new information require another blog post. Fremantle Mayor Brad Pettitt is adamant that council had not stopped supply and was going to consider funding the 2014 event during the next budget talks, so why is the official statement from FotoFreo that the City of Fremantle would no longer sponsor it, what has happened behind the scenes? I have talked to quite a few people, including a City arts officer, who tell me there was discontent when Bob Hewitt resigned about how he handed over. Bob was well known to want to control everything as he saw FotoFreo as his baby. He more or less admits that in the West Australian. His style upset competent people like former manager Laura Beilby who decided not to continue working for FotoFreo. My insiders tell me the board of FF realised they did not have the people to organise the event and no money, so that’s why they decided to pull the plug, not because the Mayor or City officers had told them they would not get funded. It would be good if FotoFreo came clear about the real reasons why Fremantle is losing this great photography showcase as Eventscorp also say they would have considered sponsering it again if an application had been lodged. Someone is not telling the truth! Please explain City of Fremantle: No support for FotoFreo, the biggest photo show in Western Australia, no support for Sculpture@Bathers, the biggest sculpture show ever in Fremantle, no support to let professionals with a proven track record turn Victoria Hall into a performance venue, instead you want to manage it yourselves. There is no City of Fremantle art award when this city claims to be the city of arts and many local councils have funding to acquire new artworks each year, you still have not found a new home for the Circus School, Freo still does not have a indigenous cultural centre, the Fremantle Chamber Orchestra is constantly begging for the City to support it, Deckchair Theatre disappears without much of an attempt to save it, Harbour Theatre will need a new home once the Point Street redevelopment starts, City officers treat J Shed artists with contempt, you renege on your support for the re-opening of the Kelp bar at Kidogo Arthouse, you don’t make an effort to keep the Hulbert Street Fiesta going. City of arts? It’s more like the city of farts. A heap of hot air that smells of incompetence. I am disappointed to hear that the biannual FotoFreo will not happen in 2014 and might not resurface at all. FotoFreo guru Bob Hewitt told me yesterday that the City of Fremantle is not willing to sponsor the event any longer and that this would also make it hard to get Eventscorp funding. Without sponsorship we can’t continue, Bob told me. FotoFreo was a good event, showcasing some of the best photography around, but there have been grumbles about FF losing direction and growing too big, with the huge Midland Workshops show and other shows well outside Fremantle making the event lose its local identity. There has also been unhappiness about Bob Hewitt running the organisation too autocratic and therefor losing the support of very skilled people. Sometimes taking on too much ownership and control pushes people away. It will be a loss for Fremantle and photography not to have FotoFreo anymore. I participated in three of them over the last ten years and always enjoyed catching up with colleagues and seeing outstanding photography. FotoFreo however never got the national and international visitors’ numbers it anticipated to get and that might well be one of the reasons sponsorship is no longer forthcoming. I have been trying to get the winning photos from the FOTOFREO W.A. Life competition, but winner Mike Wishart told me he does not want to release his image till the end of FotoFreo. Runner up Melinda Ison-Poor kindly emailed me her B&W photo The Swan Moment. I went to have a look at a few more FotoFreo 2012 shows in Fremantle Prison and at Artsource, and opened Peter Zuvela‘s show at Kidogo late afternoon on Sunday. It was nice to see Fremantle Mayor Brad Pettitt at Peter’s opening. Photography maestro Richard Woldendorp, well know for his stunning aerial landscape photos of Australia, opened the show at Artsource. He is still very much on the ball at 85 and is still hanging out of planes and helicopters. I was disappointed with David Flanagan’s large Black&White aerial photos. They are too soft and should have been printed with more contrast. Some of the images would have looked much better with a substantial bit of guts. There was nothing at Artsource that had the wow factor for me, but of course that is only my taste and opinion, so go and see it for yourself. 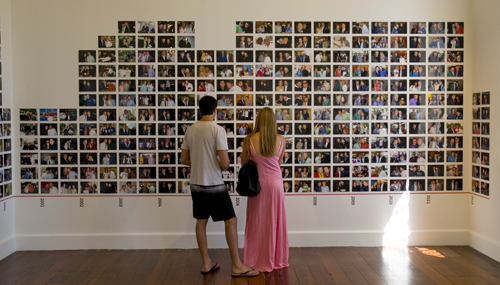 At Fremantle Prison is the 10×10 Australian Photographers show. The photos are all taken with the same camera by well known shooters like Max Pam, Jack Picone, Tim Page, John Ogden, Heide Smith, etc. I found most of the images pretty boring and without soul and feeling. Many look like basic good quality tourist shots. I walked out wondering if the photographers were taken the p… testing with how much they could get away until the art crowd starts rejecting them for their pretentiousness. Disappointing! Also at the prison are eerie ghostlike portraits in the landscape by Helene Fjell. They are soft and blurred and confronting. They made me feel uncomfortable. Places like my favourite hang out the Moore&Moore, and the XWray and Tropicana cafes are what Fremantle is all about for me. This is the character we need to preserve in Freo. Even if the Moore&Moore in Henry Street had the worst coffee and food in town, which it hasn’t, I’d still go there because it is the place of the beautiful people. The delightful and gorgeous waitresses and female kitchen staff are complimented by some pretty handsome guys, but I can’t vouch for the latter, as men just don’t do it for me. The Walkley photojournalist award exhibition is on at the Moores building as part of FotoFreo 2012, so another excuse to pop in for a meal and feast the eyes. I spent a considerable part of Saturday looking at FotoFreo 2012 exhibitions and what a delight it was. There are some truly outstanding and memorable shows that are not to be missed. 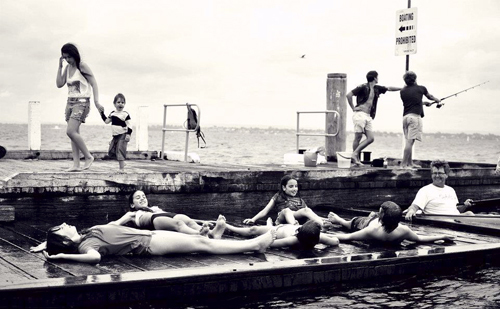 At the Maritime Museum Martin Parr captures Australiana with humour and wit in No Worries. What a delightful show this is. I am happy it has resulted in a book, as exhibitions are too fleeting, and this capture of history and folklore deserves to be preserved in a publication. It is so Australian that it almost makes one cringe at times, but with a smile on one’s face. Also at the museum is the stunning B&W show My India by Raghu Rai. This is a retrospective of photos taken over many years. There is a stunning slow speed photo of three men in white reading newspapers at a train station while many people, also mainly in white, rush by in a blur. This is great street photography that inspires me to go out and keep shooting, as it shows what a beautiful medium photography is to capture those precious moments in time. Down the road at the Buffalo Club on High Street is another stunning black&white show by Kevin Cooper. Stunning prints and very powerful photography purists will love. Seng Mah’s colourful and playful beach photos at Breaks Café on High Street is cute and clever and worth a look at, while just up from there at the Origins Cafe is a mixed bag show by four female photographers who graduated together some years ago. I like Natalie Blom’s The (indeterminable)Distance between Beauty and Decay. The photos are very strong and well printed and are a strange mix of decaying buildings and beautiful people. At Gino’s on the Cappuccino Strip Georgina Barker has her Italians in Fremantle exhibition of small B&W photos. They are o.k. but lack oomph and feeling. At the Fremantle Markets Bo Wong’s large banners, hanging from the ceiling, are pretty disappointing. They show little respect for the atmosphere and ambience of the market. I found them bland, uninspiring and soulless. Then it was off to the Fremantle Art Centre. I had not seen a single photo at the opening on Friday evening, as it was such a great time to catch up with colleagues from wide and far. If you only see one show of FotoFreo 2012, go and see Salt by Murray Fredricks. Unbelievably stunning nature photos of Lake Eyre! In the gallery next to it is Fair Game, a funky show full of satire and humour by Eric Bridgeman about black and white, as in race and skin colour. Just down from there is a room full of photos where Richard Simpkin got himself photographed with all kind of celebrities over many years. This is the pursuit of emptiness. What an empty life when one’s only claim to fame is having been captured next to many so called stars. In the main galleries of FAC is Contemporary Indian Photography. Good panoramic portraits capturing Indian lifestyle by Vidura Jang Bahadun and large posed portraits of often awkward and uncomfortable looking people by Gaur Gill. 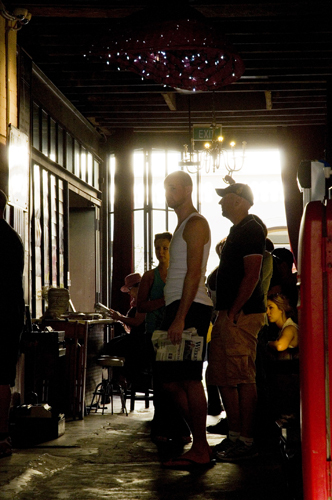 FotoFreo 2012 has got some excellent shows that should be seen by many. It is great for Fremantle, photography, and art in general to have a major international art show in our city and beyond. I had a preview of Peter Zuvela‘s photo exhibition In Search of the Ancestors at Kidogo Art House at Fremantle‘s Bathers Beach. 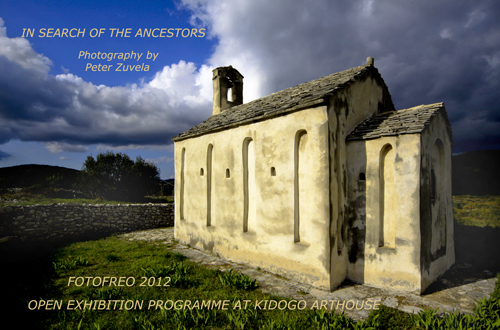 The show is part of the open section of FotoFreo 2012. It opens on Sunday the17th of March at 5 pm. The show is close to my heart, as I love history and the knowledge that it gives us a sense of belonging. History connects the presence to the future and without it we would be lost. Knowing where we came from is essential to help us decide where we want to go. The past made us who we are, that’s why knowing our past is so important. Searching for one’s history and ancestors in a foreign country must be a pretty emotional experience, and I believe Peter’s photos show that. There is a melancholy in the photos that sometimes borders on sombre, or maybe it shows being overawed when being connected to the past so directly and intimately. Or is there even nostalgia and sadness of not belonging, not knowing? Is the past somehow lost because he lives in Australia, or is he still part of that past of his ancestors that is on Korcula? There is a sense of stillnes in Peter’s photos that comes from feelings deep inside, something that is hard to explain in words, and sometimes pictures do better. Peter’s journey on the Croatian island of Korcula to trace family origins must have been fascinating and bewildering at the same time. Searching for the family tree, the roots so deep to find, must have given him a purpose and satisfaction, and the rewards are there for all to see. When he could not find, or should I say feel, what he was looking for during daytime, Peter started wandering the streets at night to find connection with the spirits of the past he was looking for. I believe the photos on show prove that he found that connection, and that he captured it with great sensitivity. I specifically like the small B&W moody streetscapes that have so much intensity and nostagia, and would have preferred the three large photos of a church to be in Black&White as well. Fremantle photographer Alastair McNaughton will have a show of the naval base shacks near Henderson as part of the FotoFreo open section. The show, which opens on Tuesday, is at the Greg James Gallery Studio at J Shed, just before the South Mole. The shacks have always intrigued me, and often when I drive south I stop to have a wander around. There is something special about this subculture, so I am looking forward to seeing Mac’s show soon.